Susan Sommers offers a variety of highly interactive, powerful presentations customized to your company or organization`s needs, budgets, and themes. Combine humour and personal experiences with exercises and group work. Can include role-playing, videotaping, lecture, small group activities, and real-life examples. Delivered in one and two hour formats and customized to your audience and occasion. Excellent for conferences, meetings, special events, and corporate weekend retreats. Join us for online health, fitness, and spirituality courses or Webinars, designed to help you to create a healthier body, mind, and spirit. Training can be delivered in 60 to 90 minute sessions, weekly courses or one-on-one coaching. customized for your company, non-profit, association, or group. We provide the strategies and tools you need to enhance your physical, mental, emotional and spiritual health. Spend time relaxing, participate in interactive workshops and seminars, and enjoy long walks, soothing massages, and delicious, fresh food. Meet and socialize with dynamic women. Plan your next cruise with our Power Source for Women team. Designed for groups of 12 or more women. 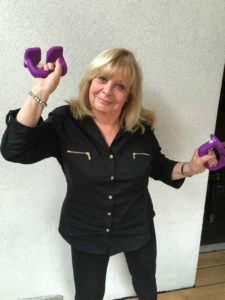 Susan Sommers started to jog-walk at 58, when she joined a YMCA Fitness Centre in Toronto. In 2005 and 2007, she completed two full Marathons (42 kilometres), walking for 7 and a half hours in each race. In the second Marathon, there was no finish line, no cheering crowds, no medal when she completed the race! In this inspirational Keynote, Susan describes the successes and obstacles she encountered while fulfilling her dreams and how she learned to appreciate her body as a source of strength and resiliency. She motivates women to make positive lifestyle choices and to take small, realistic steps to achieve maximum fitness, health, and well-being as they age. Susan also shares the principles, strategies and tools that successfully guided her through her races and into her present life of mental, physical, emotional, and spiritual joy and thriving. To date, Susan has completed 31 races, from 5k to 42k. When Susan Sommers celebrated her 70th birthday, she examined the challenges and opportunities of aging. In a poem she wrote, At 70, Susan assesses her life’s journey so far – “overcoming the immaturity of 20, the false bravado of 30, the starting over of 40, and the body transformations of 50 and 60.” In her new Keynote Presentation, Susan shares the excitement of aging well. She describes herself as strong and fit, with a passion for family, health, fitness, food, and travelling (she was a featured speaker at International Women’s Day in Jaipur, India and co-leads trips to Provence, France). 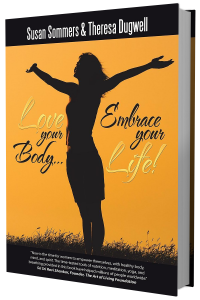 Her new book, Love Your Body…Embrace Your Life! celebrates health, fitness, nutrition, and spirituality. Are you a Self-directed Soloist- the power-within type (blue), a Creative Designer-the light, energized type (orange), a Spirited Pllanner – the self-disciplined type (purple) or a Competitive Performer – the play to win type (gold)? Participants gain a better understanding of heir unique fitness and health style and discover the fitness tools, activities, and settings that are most compatible with their natural fitness style. Susan Sommers offers an entertaining, interactive presentation based on the FIT Motivational Styles Questionnaire™ created for her two health and fitness books: Power Source for Women: Proven Fitness Strategies, Tools, and Success Stories for Women 45+ (BPS books, 2010) and Love Your Body…Embrace Your Life! (Hay House Publishing-Balboa Press, 2016). When Susan Sommers (Geyer) and Peter Geyer joined the North York YMCA in 2002, she was 57 and he was 54. Since then, they have trained for, and completed, a total of 11 Marathons and over 40 races. Peter has also entered two Boston Marathons. While Peter is a runner with speed, Susan is a walker/jogger with endurance. Although their styles, goals and results differ, Susan and Peter support each other and make fitness and integral part of their lives and marriage. This husband and wife team inspire their audiences of all ages in their entertaining and engaging presentations. In this motivational Keynote, Susan highlights 10 proven health and nutrition tools to inspire her audience to `open your mind, strengthen your body, and lift your spirit.`Learn how to embrace self-compassion and self-care; develop mindful nutrition to nourish and fuel your body; commit to meditation, breathing, and yoga techniques and exercises; incorporate fitness and a simple action plan into your daily life; develop and sustain healthy behaviours and rituals; build your own community; seek harmony, balance and a spiritual connection; recognize and celebrate your achievements; and focus on inner development, endurance, and continuous growth. In 2005 and 2007, at the age of 61 and 63, Susan Sommers completed two full Marathons – 42 kilometres – in 7 1/2 hours. 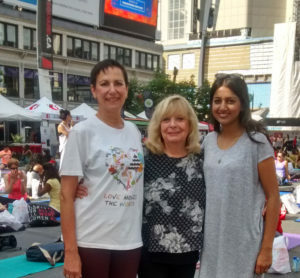 Susan started to jog/walk at 58, when she joined the YMCA in Toronto. Since 2002, she has completed 30 races, from 5K to 42K. In this inspirational Keynote Presentation, Susan shares her story and describes the obstacles and successes she encountered while fulfilling her dreams. After 35 years, Susan Sommers closed her public relations firm in 2016 and started a new business: Power Source for Women. Susan offers a fresh perspective on what it means to launch and market your own business at 50+ in today`s economy. Join Susan for this interactive, entertaining Keynote, as she describes with humour and insight how she reinvented herself and applied the strategies and tools she used to complete two Marathons and run her public relations` firm to building her new, successful venture. 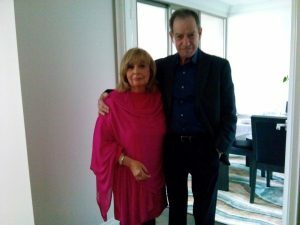 Since 1976, Susan Sommers has written 6 non-fiction books and Patricia Sands has written 6 fiction books since 2010. This workshop is designed for anyone who has a story to tell and an audience waiting to hear it. Combining humour and personal experiences in their books and in their presentations, Susan and Patricia inspire and motivate their audiences through innovative strategies and tools and their own success stories. Topics include why Susan and Patricia chose to become authors, how they started, doing the research, writing and publishing their books choosing the designs, working with editors and proofreaders, and marketing their work. Leave with a powerful Action Step to get get started.